Always have the perfect ring volume. Phone always blowing up in a meeting? Can’t ever tell you’re getting a call in the club? 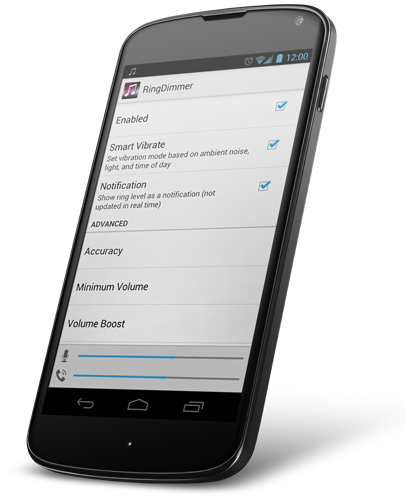 RingDimmer listens to the world around you to intelligently calculate the perfect ring volume and vibration setting. Considers many variables to find the perfect ring volume and vibrate setting. Designed with your battery in mind, with customizable options to help. app in the history of the universe. volume when going from server room to my office. almost exploded. The possibilities are endless. app. I always have the right sound volume.